I have been unable to bend my knee for 3 months and i have a limp. 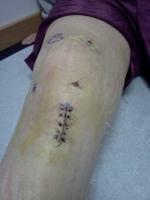 I have seen an orthapedic knee consultant who cannot find anything wroung and now i am seeing a neurologist. I have had an mri and am due to have eeg nerve test soon. My calf is swollen and so is my knee and it is a reddish colour. I have tried bending it but i cannot move it. The neurologist thinks it may be either rheumatoid arthritis or nerve entrapement.